Posted by admin on May 26th, 2012 in Blog. From all accounts, the code slayer has done his part to provide a document that allows mural production to be revived on private property within city limits. He has now moved on to a new position with the city, leaving the mural ordinance without its guardian. 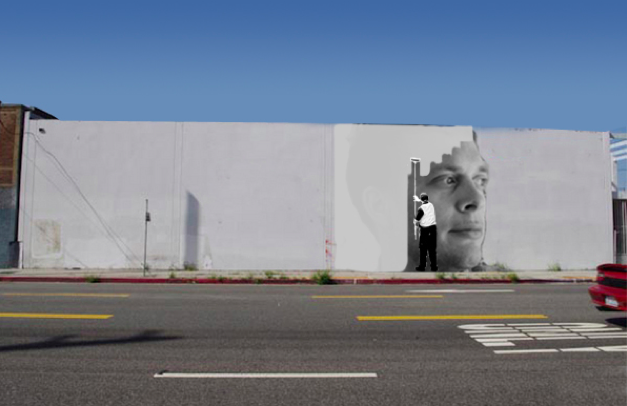 Tanner Blackman, the Los Angeles city planner who led the drafting of a new mural ordinance after a long series of workshops with artists and stakeholders, has moved on to a new position within the city of Los Angeles. Blackman is now District 14’s Director of Planning and Economic Development, that according to a Facebook post, will be have “special attention” to downtown Los Angeles. While Blackman assured that the ordinance would move forward, it remains to be seen if this turnover have the document languish on a desk in City Hall without him guiding it through city departments. What is known is that the ordinance reveal was delayed by City Hall distracted with day to day emergencies, including the contentious redistricting and the negotiation for city budgets. The ordinance is ready to be pushed onward to its final approvals. There is a preliminary sign-off in the Planning Department, and Building and Safety welcomes the shift in administrative duties which will now be handled by Cultural Affairs, as murals are removed out from under the definition of signage code. That leaves the chilling thought that the ordinance, which focuses on murals as “original works of art,” may be in the offices of the city attorney. Yet, there is still hope. District 14 Councilmember José Huizar has pushed for change since 2008, when classic murals in Boyle Heights were taken down and property owners fined for allowing new works. The call for change came from other districts with the same legacy of public art, plus artists demanding that art is not a crime. The ordinance will end the confusion that comes from different city departments enforcing their interpretation of what a mural is, or can’t be. Even now that remains a problem, as seen in the recent whitewash of a street art piece by a downtown BID, allegedly in response from a call from LAPD, and that had a property owner told he was allowing an illegal piece. Even now, there has been no statement from the BID or LAPD as to what policy they were following, or if will still be operating procedure, despite a hold on a mural moratorium while a new ordinace went through its paces of drafting and approvals. As it happens, Huizar co-chairs committees that have a say in the ordinance, and Blackman could very well lead planning direction and counsel on how to respond to his own drafted words. We know that lack of new art funding, destruction from tagging, deep pockets from media companies (saying the First Amendment applies to commercial signage), are some of the items that kept Los Angeles from maintaining its title as a leading city in outdoor mural art. With some nudging, staff turnover hopefully will not be part of that list. 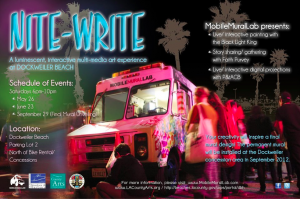 Join us for Nite-Write this Saturday the 26th @ Dockweiler Beach! Posted by admin on May 21st, 2012 in Blog. 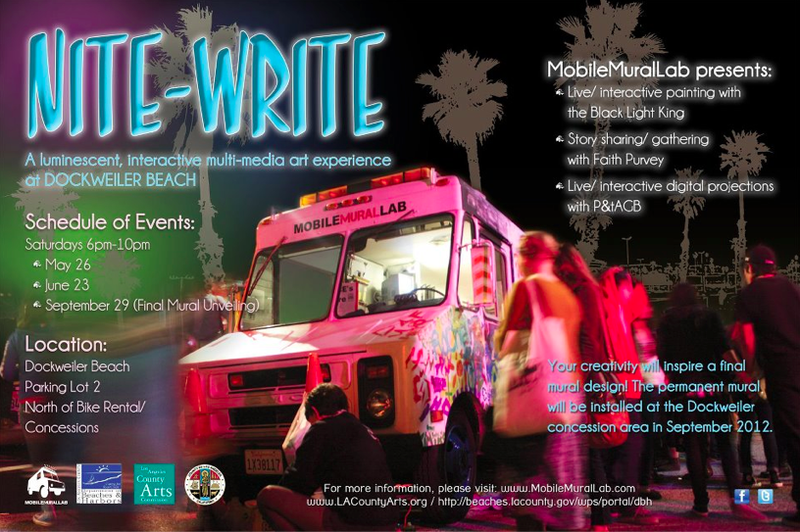 Noam Chomsky suggests the power of public, mobile, community-based art experiences and forums.